I was playing on my iPhone Yesterday, and reading Questions on my WonderPOLLS App! That’s such a Paruretic thing to do! In fact, before I began Shy Bladder Recovery, that was the ONLY way I would pee. No matter where I was, or when I peed. I always peed on the side so I would pee quietly. I didn’t want anyone, not even myself, to hear it. I was so ashamed of peeing, just the sound of it made me timid and shy. Learning and Forcing myself to pee directly into the water so it made loud splashing noises was actually my very first step to recovery (and I’m not fully recovered yet, still working on that). That was my first obstacle to overcome, getting used to the sound and noise that my pee made. Making myself not be frightened by it anymore. This was a HUGE step (breakthrough) for me. And to this day, 2 years later, I STILL pee in the water bowl so everyone can hear! In fact, even when I pee in a Urinal, I force myself to pee towards the bottom where the urine circulates so it makes noise (I don’t like standing there when it’s dead quiet). I WANT to be heard! I don’t want to hide anymore! I love that I can pee and I love that I can make noise doing so. Once I learned that, it helped me desensitize. It made everything else after that a little bit easier to cope with and deal with. Like when I’m standing at the toilet peeing with my Pee Buddy Mike. There’s no running from the sound! You can’t cover that up! You have to face it head on and tackle the beast! That’s a total of 83,059 Guys Polled (at the time of this post). And that means that only 13% of the guys pee in the center of the toilet. All the rest of them (87%) pee on the side of the bowl where it’s quiet. I told Mike this and he said that usually when he’s out in public and has to pee in a toilet, that many times he also pees on the side to reduce noise. I thought that only Pee Shy Guys did this! So I then head on over to the Comments Section of that POLL to see what Guys are saying about this topic. Me, I’m going to keep making noise as I pee. I feel it’s something I HAVE TO DO! I can’t be ashamed of peeing anymore. I’m making noise! I will NOT be denied! Yep. Pee on the side, not to reduce noise though, to reduce splash back that then makes it look like you pissed yourself. Before I elected to reduce splash back I went and it didn’t bother me because I was in works clothes and didn’t notice the smell of piss that had soaked in to the legs until one day someone said, whats that toilet smell, it smells like an old Victorian public toilets. My boss then pulled me in the office and told me to wash my trousers because they had a complaint about `the disgusting toilet smell` of the delivery guy. So peeing on the side reduces splash back, especially when you aim properly and get the most efficient angle in the pan. Pee with too much of a direct angle is same as peeing in the middle, you get splash back. So remember guys, peeing in the middle is not doing yourself any favours at being manly. For some of us guys, it is quite a process to overcome being embarrassed about the noise we make when we pee standing up at a toilet. I never had a problem peeing outdoors or into a urinal, or when being naked around any of the family when I was growing up. Since I was about 11 years old, I always sat to pee when using the toilet because of the sound. Our toilet did not have much surface area along the sides or the back, so it was nearly impossible to aim for outside the water and not make a mess. I think a large part of why I sat to pee was because my sister’s bedroom was next to the bathroom. When she and I were playing together, we would hear my dad or my uncles when they peed. It was always loud, and sis commented on it. Her comments made me embarrassed for her to hear me pee. Oddly enough, I was able to tell which dad was peeing by their unique style and sound of peeing. I had a friend when I was in my 20s who had 2 brothers; no sisters. The 3 boys ranged in age from 15 to 20, and lived in their family home. The main bathroom was next to the living room, and they always peed with the door open. It seemed a little awkward when one of the boys would go pee while I was talking to their mom. I asked my friend about it, and he said that they have always peed with the door open at home, even when there were guests. He wondered why I would care that someone could hear me pee? “We all do it!” I guess it is how we are raised and what is normal for each of us. As I got older, it started to bother me that when it was just a group of us guys hanging out and partying that I would hear them pee, yet I never made a sound when it was my turn. Some of my guy friends (other than the ones mentioned above) also left the door open and peed directly into the water with total indifference, both at their place and when they visited me. I was so envious about how uninhibited they were! I wouldn’t dream of peeing loudly while women were visiting, but I was on a mission to learn to “pee like a guy”, and demonstrate my new talent when we hung out next.. I live alone and was able to train myself gradually without any interference. I shut the bathroom window so the sound would not travel outside of my apartment. I flipped the seat up, stood in position, aimed, and waited. The flow did not start. I had to tell myself to relax and that nothing would happen by me standing instead of sitting. If my aim was off, I could easily clean up. After several minutes, my bladder won and I began to pee. I was proudly surprised at how forceful my pee stream was, and loved the sound that I made. It was an accomplishment for me after years of sitting. I quickly noticed how my bathroom developed a smell of lingering urine caused by the backsplash. I was not going to let that stop me and kept a rag under the sink cabinet to touch up. There is a young guy living next to me Our bathrooms are back-to-back. After several months of him living next to me, I never heard him pee. I decided to break the ice. One morning, I could hear that he was in his bathroom when I went for my first morning piss. I blasted my stream directly into the middle of the water and made a deafening sound that the neighbor couldn’t miss. It was a 2 minute piss, complete with shooting the last few bursts at the end. The next morning, I stepped into the bathroom and could not miss the sound of his pee stream hitting the water. Maybe he had been waiting until he heard me pee before he would allow his aim to hit the center of the water. I did a repeat of the day before and peed for 2 minutes. Since then, we hear eachother pee every day. He had a girl spend the night one Friday. I could hear the 2 of them talking in his bathroom the next morning when I went for the first pee of the day. I chuckled to myself as my urine blasted the water. It went on and on, and I can only imagine that his girl was probably surprised that I could pee so long. There are some public bathrooms here that have steel urinals with about an inch of water in the bottom. In years past, I always aimed for the back. Now, I deliberately aim for the water. The acoustics make the sound resonate loudly. The arched roof with an opening between the mens and the womens allows the full sound to travel. 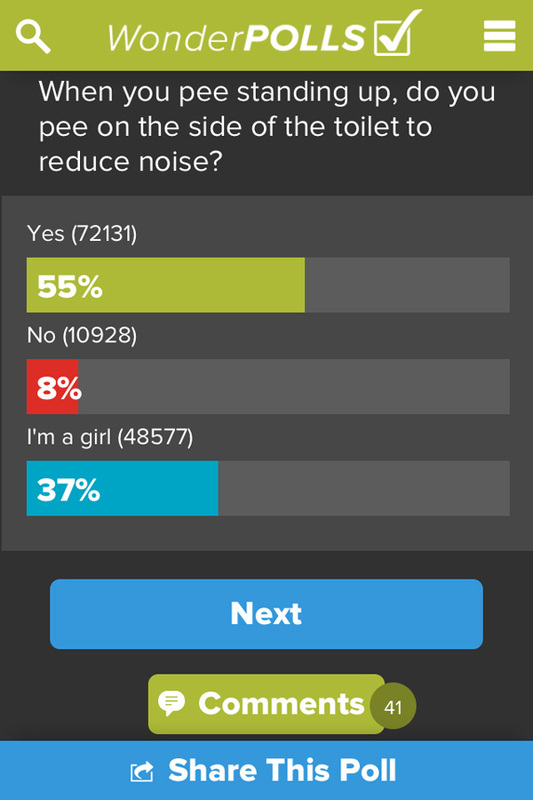 I am not the least bit embarrassed if girls and women that I don’t know can hear me pee. I have overcome most of my issue with standing to pee at a toilet and aiming for the center of the water. The only exception is my female friend and her daughter, and any of my female relatives. I honestly don’t know if I’ll ever break through those barriers. Hi Richard: I wanted to follow up on my previous message. 1: I can be embarrassed for her to hear me pee, and sit. For months after they moved in, I sat. I never heard the guy pee, or I would have been more brave sooner. If I saw them leave their apartment and I was due for a piss, I went right away. Each time, I enjoyed the experience of taking position in front of the toilet, peeing into the water of the toilet, and the loved the sound I made. I had to ask myself did it really matter if my female neighbor could hear me pee? Last summer, it was time for me to get over my new neighbors. I reverted to standing to pee every time (except for the middle of the night). It seemed to be fine, and they didn’t act any different when we saw each other. In January, I got sick, and fell back into sitting to pee. A few times, my balls took an unexpected dip in the toilet water. More incentive to stand! Since last weekend, I’m back to standing. Tonight, I was watching TV and could hear that the couple had a visitor. After the visitor left, it got quiet in their apartment. I realized that I needed to pee. I had been putting it off, and asked myself If I’m going to stand or sit? Meanwhile, the guy used the toilet first (without a sound); then the gal. I knew that they were heading to bed. “Well bro? What’s it going to be?” At that point, I was desperate and couldn’t hold it any longer. I took position at the front of the toilet and let it rip. There was so much force behind my stream that the couple for sure heard it from their bed. I gloated. It sounded fabulous! Only guys who have this particular type of pee shyness can relate to the jubilant feeling of taking a loud piss when you know others can hear.